One of the most common and anguish-filled birth defects is a cleft lip or palate (roof of the mouth). Not only do clefts disrupt the normality of a child’s facial appearance, they can also lead to problems with chewing, speech and the long-term health of teeth and gums. A cleft is a tissue gap that occurs during fetal development, usually in the first trimester, in which parts of the baby’s face fail to unite. Why this occurs is not fully understood, but vitamin imbalances in the mother, exposure to radiation or other toxic environments, or infections are all believed to play a role. Facial clefts are classified as either incomplete, in which there is some but not full tissue fusion, or complete, with no fusion at all. A cleft can be unilateral, affecting only one side of the face, or bi-lateral, affecting both sides. During infancy a cleft can adversely affect a child’s ability to nurse, and it sometimes disrupts breathing. As the child grows, speech patterns may be severely disrupted and their teeth and bite may not develop properly. 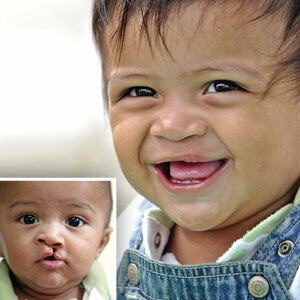 Fortunately, there have been dramatic advances in cleft repair over the past sixty years. It’s actually a process that can span a child’s entire developmental years and involve the expertise of a number of surgical and dental specialists. For a cleft lip, the initial surgical repair to realign and join the separated tissues usually occurs around three to six months of age; repair of a cleft palate (where the gap extends into the roof of the mouth) between 6 and 12 months. Subsequent procedures may be needed in later years to refine earlier results and to accommodate the mouth’s continuing growth. At some point the treatment focus shifts to cosmetic enhancement (which can include implants, crown or bridgework) and periodontal health, to ensure gum tissues that support teeth and gums aren’t compromised by the effects of the cleft or its treatment. At the end of this long process, something of a miracle may seem to occur: a young person’s once disfigured mouth transforms into a beautiful smile. It’s a chance for them to gain a normal life — and a new lease on physical, emotional and oral health. If you would like more information on cleft reconstructive surgery, please contact us or schedule an appointment for a consultation.